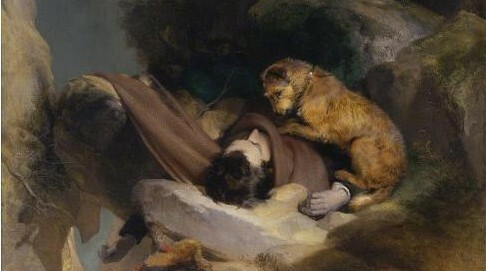 Sir Edwin Henry Landseer, Attachment [detail]. 1829. Oil on canvas. 39 7/8 x 32 7/8 in. Saint Louis Art Museum. All U.S. cemeteries listed below allow for the interment of human and pet remains. These green cemeteries are wildlife preserves which allow an animal’s remains to be buried in a family’s cemetery plot (as tiered or adjacent graves). For a review of pertinent Main cemetery laws as well as the case of Tiddy, visit Myers Law blog. White Eagle Memorial Preserve Cemetery, Goldendale, WA. “We have designated the area along the outside perimeter of White Eagle as a place to bury pets.” This land is a conservation stewardship area which is legally protected in perpetuity. * Certified by the Green Burial Council. These cemeteries allow human and pet remains (full-body and/or cremains) to be interred together, some also have a separate pet section. Contact each cemetery for specific policies. When contacting a pet cemetery – always make sure it is deeded in perpetuity. Rolling Acres Complex in Lincoln, NE. Tom and Pat manage their cemetery, will be flexible to meet requests. Area C allows for green burials which currently accounts for about 5% of requests, with growing interest among those under 40. Best Friends Forever at Sunset Memorial Park, Albuquerque, NM. They provide full-body burials of pets’ remains as well as cremains. In this pet cemetery, only human cremains may be buried. For those seeking a ‘green burial’, a biodegradable casket is laid directly upon the earth – but all caskets are covered with a domed polyurethane vault (as of 12/20/15). Human Cemeteries: New York allows pet cremains to be buried in human cemeteries. Vale Cemetery, Schenectady, NY. They also have a small green burial section, but can only bury pet cremains. (added 10/16/17) – news article. Pet Cemeteries: New York allows human cremains to be buried with the remains of a pet in pet cemeteries. Contact cemeteries for their policies and check to see if the pet cemetery is deeded in perpetuity. People and Pet Gardens at Hillcrest Memorial Park in Hermitage, PA. They inter pets and humans, but they don’t provide green burial options at this time. Noah’s Ark Pet Cemetery, adjacent to National Memorial Park Cemetery, 7482 Lee Highway, Falls Church, VA 22042, 703-560-4400 ext.4737 (ask for Kimberly Mosser). Part of the Dignity Memorial network of funeral service providers. Cremated remains of an animal may be buried in the casket of a deceased human. Sierra Hills Pet Cemetery at East Lawn Sierra Hills Memorial Park, Sacramento, CA (added 7/3/15) – Designated as a separate pet cemetery, with one portion, St. Francis Pet Estates, separated from the human burial side by a demarcation line. Not a green cemetery – plastic caskets and cremains only. – news article. Evergreen Memorial Cemetery, Bloomington, IL – since 2011, they permit the burial of dog and cat remains in a separate section. Roselawn Pet Cemetery of Roselawn Memorial Park, Springfield, IL. (added 6/19/15) – news article. Whispering Woods at Springdale Cemetery, Peoria, IL (added 8/8/15) – news brief. They are considering a green burial section and are receptive to hearing your requests. Heaven’s Pets at Lake Lawn Metairie Cemetery, New Orleans, LA. – Interment of pet cremains only. (added 12/24/15). Reflections Garden at Toledo Memorial Park, Sylvania, OH (added 6/20/15) – news article. Burial of pet cremains only. Thanks Gregg! Feel free to share with others – and keep in touch!